A small town in the Scottish Borders, Kelso lies on the north bank of the River Tweed near its junction with the Teviot, 19 miles (30 km) east of Selkirk and 10 miles (16 km) southwest of Coldstream. Described by Sir Walter Scott, who studied here as a child, as the "prettiest, if not the most romantic village in Scotland", Kelso initially developed in association with a Benedictine abbey founded in 1128 by King David I. It was raised to the status of an ecclesiastical burgh in the early 13th century and remained one of the wealthiest and most important religious centres in the Scottish Borders until the abbey was destroyed in 1545 during the Reformation. King James III was crowned as an infant in the abbey which passed as a ruin into the hands of the earls of Roxburghe, the owners of nearby Floors Castle, in 1607. Destroyed on a number of occasions, the town was designated a burgh of barony in 1644 and thereafter developed as a market town with brewing, shoe-making and textile industries. Two bridges across the Tweed erected in 1754 and 1800-03 made Kelso an important centre of communication. Cattle were traded here until 1930 and an annual ram market is still held annually in September in addition to the Border Union Agricultural Show which takes place each July. Modern industries include tourism and the manufacture of agricultural machinery, soft drinks, plastics and electronics. 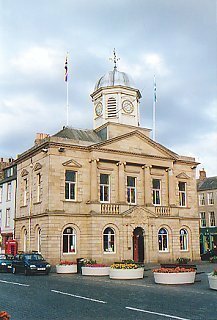 Buildings of interest include the Italianate Town Hall (1816), the Corn Exchange (1855), octagonal Parish Church (1771-73) and Ednam House (1761). Scott's first major work, the Border Minstrelsy, was published by James Ballantyne of Kelso in 1802-03. A young man known as the Kelsae Laddie leads the Common Riding, which takes annually in the middle of July as part of the Kelso Civic Week, first instituted in 1937.